For many years, both my wife and I have been driving Nissan vehicles, and I’ve been very happy with them. In fact, I’ve been so happy that I bought out both leases and kept the cars longer then I might normally have. Several years ago, I went to Maple Nissan in Vaughan, since I had an issue with the tire pressure sensor in one of my vehicles. I rarely contact the dealerships as I have a few trusted mechanics that I go to for all my work, but for something like this, I did my research, and learned that it’s better to have the actual Nissan factory product, which is significantly pricier than after market products. Fast forward to a couple of weeks ago, and the tire pressure sensor came on again. After checking the pressure in the tires and discovering they were all fine, I thought, there is a good chance that this was a problem with the sensor. Since the initial repair was done less then two years ago, and was somewhat expensive, I decided to follow up with the dealership. I called them up and introduced myself to the Service Manager, Matthew Grieco, and told him that I used to deal with one of his colleagues who no longer works there. I explained the issue to Matthew and told him I was a bit upset since it wasn’t too long ago that I fixed the sensors for the first time. Matthew told me to come over to the dealership so they could make sure that this was in fact an issue with the sensor and have a look at what they could do about it. We then arranged a specific time and I headed to Maple Nissan. As soon as I arrived at Maple Nissan, Matthew was there to greet me and had one of his mechanics take a look at the vehicle. After about 15 minutes, Matthew told me that they were reprogramming some of the sensors and this should take care of the issue. While I was glad that the problem seemed relatively minor, I was prepared for a hefty ding of a diagnostics fee (anyone who’s been to a dealer knows the feeling of receiving the dreaded bill at the end all too well). However, Matthew told me it was no problem and not to worry about a charge. Matthew said he was glad to take care of the problem and apologized for the inconvenience. In a day and age when most automotive dealerships are making money off of service, Matthew could have easily charged me for diagnosing the problem but he took care of it, and kept me very pleased. Since then, I have told a few friends how great the service is at Maple Nissan. 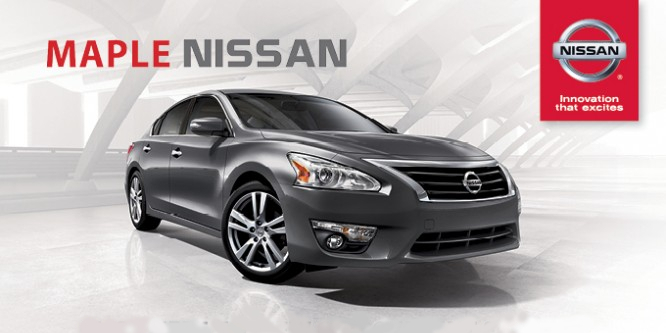 At Maple Nissan they stand behind their product and provide excellent customer service. It goes without saying, if I ever need to buy another Nissan, I’ll go back to them. Brand Standards, Canada, Customer, Customer Experience, Customer Service, Excellent Customer Service, Maple Dealerships, Maple Nissan Dealership, Maple Ontario, Nissan Cars, Nissan Dealership, Nissan Maple Dealership, Nissan Service Provider, Sensors Quality Management, Sensors Quality Management Inc, SQM, SQM Inc.